Today is that day that the Apple Watch begins arriving at the doorsteps of those lucky enough to have pre-ordered a first-round unit. iFixit has already received a 38mm Sport model with a blue Sports Band, and as usual, they've decided to give the smartwatch the full teardown treatment. 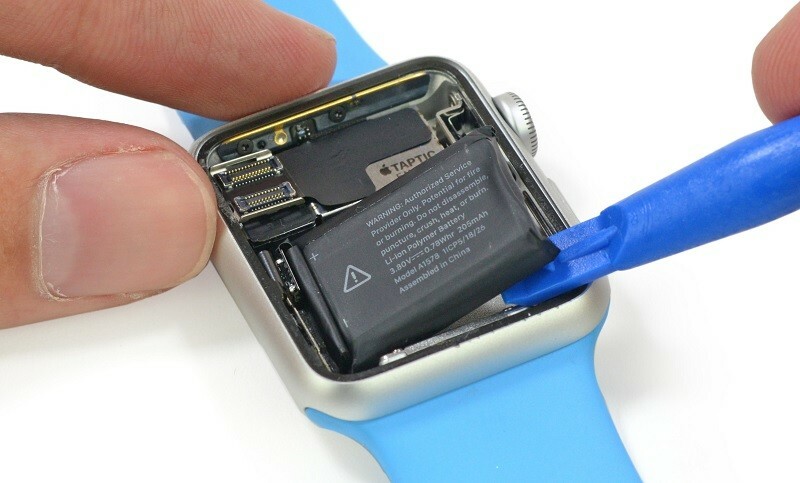 To access the innards of the Apple Watch, iFixit first removed the display, revealing a small 205 mAh battery that occupies around half of the internal space. Above the battery is Apple's Taptic Engine, which is a linear actuator that provides haptic feedback paired with a subtle speaker. Behind the Taptic Engine and the battery is where the Apple S1 processor can be found, housing basically all of the chips required for the smartwatch's operation including the CPU, GPU, RAM, NAND and wireless radios. iFixit notes that the S1 is actually pretty difficult to remove, and it's unlikely that this will be an upgradeable part as was originally rumored. Underneath the S1 is a range of sensors, and around the edges are connectors for the clever digital crown, and the side button. Many of the components are well integrated and sealed, as the Apple Watch is IPX7 water resistant, allowing submersion in 1 meter of fresh water for up to 30 minutes. Several of the Apple Watch's components appear to be quite difficult to access and replace, especially in the 38mm model that iFixit tore down. The 42mm model is expected to have a slightly larger battery, but an internal layout that's largely the same. If you need to replace something from inside the smartwatch, it might be best to leave it to Apple.